Kristan Hawkins, President, Students for Life of America: While I know we winning with this generation on abortion, we still have a long way to go, especially with the those in our parent's generation who run our schools and universities. 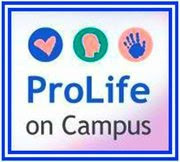 Last week as Students for Life of America was on the University of Michigan campus with our What Has Roe Done of Us? Tour, educating and dialoging with students about how abortion exploits and harms women, we found out that the university was endorsing a different message to their students. The University is currently sponsoring a pro-abortion "art" display called 4000 Years of Choice, which declares “Abortion as a Blessing” and a “gift from God.” This directly counters the truth put forth in SFLA’s display which tells the stories of women like Jennifer Morbelli, Karnamaya Mongar, Tonya Reaves, and Marla Cardamone who were killed through legal abortion. What??? While Heather Ault is trying to portray herself as an abortion historian, the truth is that she is radical, abortion activist, and the University of Michigan has funded her message through taxpayer money. Take a look at her “art” and decide for yourself whether or not her display is not pro-abortion. Abortion is never safe for women, legal or illegal, and for the University of Michigan to have the audacity to use taxpayer dollars and a taxpayer-funded building to push forth an agenda and human rights violation that the majority of Americans oppose is disgusting. Call the University of Michigan President, Mary Sue Coleman, at 734-764-6270 or email her at presoff@umich.edu and demand that she sees that this display is taken down, that all taxpayer money is returned for this event and display, and that never again will UM align themselves so closely with abortion as to allow public funds to be invested in a flagrant agenda to support and promote abortion. It is an outrage for the University of Michigan to endorse this anti-human rights message that “abortion is a gift from God” and that it is “a blessing.” I hope you can join us to get the university to take down this horrific display and help us reach thousands more of students with our message of truth and hope. P.S. - Don't forget to call 734-764-6270 today and demand that the University of Michigan take down this awful display. Tags: University of Michigan, pro-abortion art, display, 4000 Years of Choice, call the University, Kristan Hawkins, Students for Life of America To share or post to your site, click on "Post Link". Please mention / link to the Greater Fitchburg For Life. Thanks! 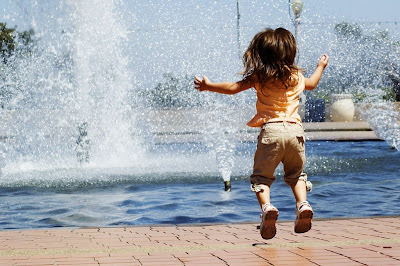 … 321 babies that have been saved from abortion! Praise God for His mercy and love! There are two reports today. One shows the power of a strong, consistent pro-life witness. The other shows the agony a woman goes through when it’s clear the “choice” to have an abortion is not her own. It helps that a local pregnancy center parks its mobile ultrasound RV outside the abortion center – an impossible-to-ignore, positive resource that has encouraged so many women reject abortion. I had a great visit with the Charlotte team, including Katherine and Andrea, the two women who first brought 40 Days for Life to the area … even before it became a national campaign (their story of courage and success is featured in the 40 Days for Life book). The abortion center knows the combination of prayer and a determined, life-affirming witness on the sidewalk is hurting business. So their security guard is outside regularly, yelling at volunteers and turning up loud rap music on his car’s sound system in an attempt to silence the prayers. I saw this for myself! But it isn’t working. Since March 5, it has failed on at least 46 occasions! As Carrie, her friend Laura and their children prayed at the 40 Days for Life vigil in Brisbane, a drama played out before their eyes outside the Dr. Marie abortion facility. It certainly looked like the woman had no interest in going inside. So they turned away and sat in the garden for a while. Carrie and Laura smiled at them, prayed quietly, and kept watch with the children. After a time, they walked towards the door again. The man walked up the steps, but the woman stopped, threw her bags down and started crying. She kept looking at the vigil participants’ faces … and the children. “We were just being there,” Carrie said. They approached the door one more time and the woman still refused to go in again. This time, they left and did not return. The volunteers prayed that this woman would continue to be brave and refuse to abort her child. “It was profound to be there, keeping watch,” Carrie said. “It is a very sad place to be in the world, but we were there — being light in a dark place. To share or post to your site, click on "Post Link". Please mention / link to the Greater Fitchburg For Life. Thanks! Hi Lord, our Heavenly Father, it’s me. We are getting older and things are getting ...bad here. but Lord I'm asking you to come back and re-bless America . We really need you! Badly. Look there are more of us who want you than those who don't! Thank You Lord, I Love You. If you agree, send it on---if not, just delete. "Life without God is like an un-sharpened pencil - it has no point. 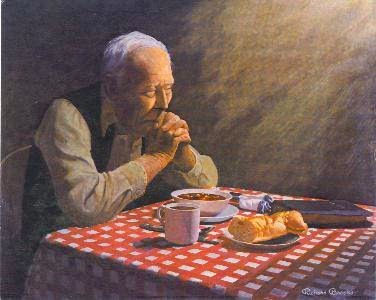 Tags: prayer, our Nation To share or post to your site, click on "Post Link". Please mention / link to the Greater Fitchburg For Life. Thanks! by Shawn Carney, Campaign Director, 40 Days for Life: There are stories of God’s blessings and God’s victories at 40 Days for Life vigils. But there are also stories of pain. 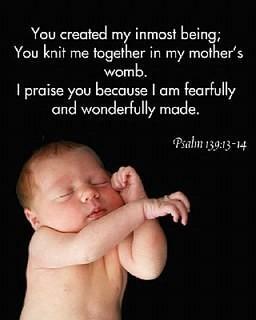 There are hearts that are hurting in this battle to end abortion, and they all need your prayers. As you pray this Sunday, particularly at church, please ask the Lord to share His grace with those who are suffering … and that He will provide the spiritual healing they so desperately need – and can find only in Christ. While people prayed in the rain at the 40 Days for Life vigil in Sacramento, Wynette – the local coordinator – watched a scene unfold outside the abortion center. “Several abortion business employees huddled together, holding their umbrellas, as they took turns hugging one abortion worker in particular,” she said … wondering what was going on. A few minutes later, that worker exited the driveway right in front of Wynette and rolled down the car window, ignoring the falling rain. "I've had enough!” the distraught worker called out. “I hate this place! I quit!” “I cannot say much more,” Wynette said ... but she added that the worker asked for prayer. 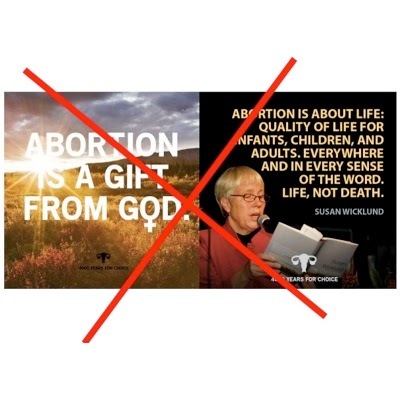 She encouraged prayer “for all abortion industry employees, in hopes that they would discontinue their involvement in destroying lives and hurting women. One of the prayer volunteers (I'm keeping the location confidential) tried her level best to convince a young couple to reject abortion and spare their baby. She poured her heart out. But the pair walked into the abortion center and kept their appointment, and the vigil participant was overcome with a profound sense of failure. One of the other volunteers knew the feeling – all too well. “I’ve been there,” she said, as she began to minister to the other woman. This vigil participant acknowledged that she’d had an abortion, but had experienced recovery and found forgiveness. The volunteers shared information about healing after abortion with their friend, who was still in tears. “We were able to pray with her and her healing began,” the leader said. Still, the woman felt the need to return to the vigil. “I just want to save a baby,” she said. Tags: Forty Days for Life, abortion centers, Day 26, Sacramento, California To share or post to your site, click on "Post Link". Please mention / link to the Greater Fitchburg For Life. Thanks! Tony Perkins FRC Washington Update: In the abortion debate, there aren't many areas where the two sides agree. But shouldn't women's safety be one of them? Planned Parenthood doesn't think so -- and spends hundreds of thousands of dollars in legal fees proving it. In one of the greatest ironies of politics, the one thing standing between women and safe abortions continues to be the people providing them. In Texas, the abortion giant isn't fighting the "war on women," it's fighting the war on health care accountability. No sooner had Governor Rick Perry (R) signed his name to the bottom of HB 2 than Cecile Richards's group was in court, filing for the right to keep the clinics' shoddy standards in place. Despite a five-clinic sting that same month, in which inspectors found everything from rusty suction machines to contaminated medicine in several locations, a lower court sided with Planned Parenthood in its crusade to protect clinics from the accountability they so desperately need. Yesterday, the Fifth Circuit Court of Appeals ruled on the side of women's health and upheld the state's abortion rules -- dealing a huge blow to Planned Parenthood and other groups who insisted that the law didn't protect women, but instead put an "undue burden" on them. A three-judge panel of the Fifth Circuit unanimously disagreed. Instead, the judges -- all women, ironically -- believe HB 2 "reduces the risk that abortion patients will be subjected to woefully inadequate treatment." 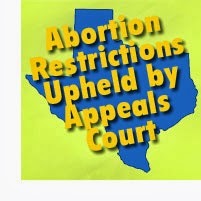 "During these proceedings," Judge Edith Jones wrote, "Planned Parenthood conceded that at least 210 women in Texas annually must be hospitalized after seeking an abortion. 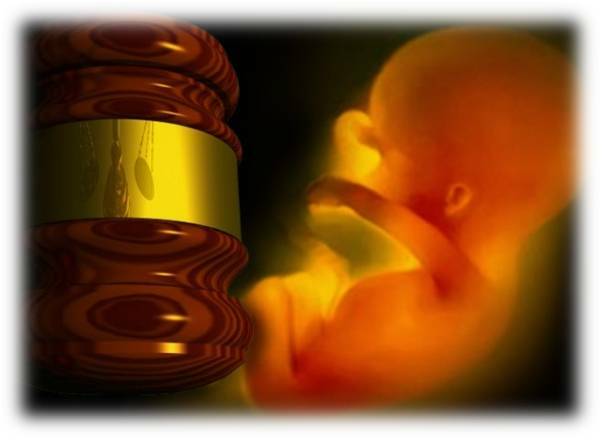 Witnesses on both sides further testified that some of the women who are hospitalized after an abortion have complications that require an Ob/Gyn specialist's treatment." Under the ruling, two sections of HB 2 were upheld: the requirement that doctors have admitting privileges at a nearly hospital and a mandate that the dangerous RU-486 abortion drug (responsible for killing at least 10 women) be administered according to FDA procedure. Sounds logical enough. Not to Planned Parenthood, apparently, which blasted the judges' opinion as an infringement of a woman's right (to sub par care). "Safe and legal abortion will continue to be virtually impossible for thousands of Texas women to access." If that's true, it's only because abortion tycoons like Planned Parenthood refuse to spare the money to upgrade their system. Like most of the industry, they say they care about women but refuse to prove it with simple modifications. As a result, 19 Texas abortion clinics have closed after failing to meet these common sense health standards. For Governor Rick Perry (R) and state leaders, who survived death threats, Satan chants, political bullying, and even being chased down Capitol hallways for supporting the law, Thursday's victory was especially sweet. "The people of Texas have spoken through their elected leaders and in support of protecting the culture of life in our state," Governor Perry told reporters. Meanwhile, the Fifth Circuit's decision was a huge rebuke of state Senator Wendy Davis, who became a household name for single-handedly trying to keep Texas's abortion regulations as lax as possible. Thanks to this ruling, Americans are finally getting a picture of who the real extremists are. Tags: Tony Perkins, Family Research Council, FRC, Fifth Circuit Court, Planned Parenthood, Texas, Planned Parenthood To share or post to your site, click on "Post Link". Please mention / link to the Greater Fitchburg For Life. Thanks! by Shawn Carney, Campaign Director, 40 Days for Life: God has taken 40 Days for Life to some unexpected places during the past six years – but none quite so unexpected as Russia. The second 40 Days for Life campaign in Moscow is now going on …. and there are plans for more Russian campaigns in the future. Robert Colquhoun, our international outreach director, just visited Moscow to encourage the volunteers there. Here’s Robert’s report from the capital of Russia. It was a great trip! I enjoyed meeting Arevik, the local leader in Moscow, and enjoyed their kind hospitality. I also met Anastasia, who wants to start a campaign in St. Petersburg. A number of other cities have also followed on board praying for life. A press conference at the Interfax news agency was the highlight of the trip. It was a bit odd to have a receptive national media willing to spread your message – as opposed to the UK and the US. At this event, Arevik spoke about the history of abortion in Russia and how that has shaped people’s values and mentality. In 1920, Russia became the first country in the world to legalise abortion. For several generations of women, Arevik said, abortion was the primary means of birth control. Abortion became the norm, and a significant portion of the population believes that a person’s life begins at birth, not conception. I was able to meet with Father Dimitry, an Orthodox priest, and Bishop Matts-Ola Iskhoel, the senior pastor of Word of Life Church in Moscow, which is Arevik’s church. This church is well organised, with about 4,000 members and seven churches in Moscow. The Moscow vigil has been beset by challenges. For one thing, public prayer is something totally inconceivable in Russia. In addition to that, the police have not granted permission for the vigil this year, apart from having a small number of people for a very restricted period. The police stopped some of the prayer volunteers on the first day because of this. However, they are still praying around the corner and keeping the vigil going. Last year, they conducted the vigil more anonymously; but this year, they wanted to have signs. Freedom of expression is not something that is deeply enshrined in Russia. But Arevik hopes this will change over time. In short, the Russian volunteers are doing great in adverse situations – and hats off to them! Thanks to Robert Colquhoun for this special look at 40 Days for Life in Russia. Tags: Forty Days for Life, abortion centers, Day 25, Moscow, Russia To share or post to your site, click on "Post Link". Please mention / link to the Greater Fitchburg For Life. Thanks! by Gary Bauer: As Chief Justice John Roberts reminded us in upholding Obamacare two years ago, it is always risky to try to predict the outcome of a Supreme Court case based on oral arguments. But multiple reports suggest a clear majority of justices today were hostile to the Obama Administration's defense of Obamacare's contraception mandate, which would force religious business owners to pay for abortion-inducing drugs and sterilizations. From CNN came this headline: "Court Majority Harshly Critical Of Obamacare Contraception Mandate." And there was this headline from the Los Angeles Times: "Justices Sound Ready To Reject Contraceptives Mandate Under Obamacare." Justice Anthony Kennedy, often the swing vote in major cases, seemed particularly critical. At one point, Kennedy said to Solicitor General Donald Verrilli, "Your reasoning would permit requiring profit-making corporations to pay for abortions." There are reports that even liberal Justice Stephen Breyer seemed to be searching for a way to roll back the mandate, perhaps resulting in a 6-to-3 ruling. A decision is not expected until summer. Please keep this decision and the justices in your prayers. And do not forget the Hobby Lobby case when discussing Obamacare with your friends and relatives. If they lose this case, Hobby Lobby's owners are facing fines in excess of $1 million a day if they refuse to violate their deeply held values. The left is constantly assaulting our fundamental freedoms. Men and women of faith cannot remain on the sidelines in America's culture war. Religious liberty hangs in the balance. Gary Bauer is is a conservative family values advocate and serves as president of American Values and chairman of the Campaign for Working Families. He is also a contributing author in the ARRA News Service. Tags: Gary Bauer, Campaign for Working Families, Government Mandated Contraception, Religious Liberty To share or post to your site, click on "Post Link". Please mention / link to the Greater Fitchburg For Life. Thanks! Tags: Penny Nance, Concerned Women for America, Supreme Court, religious freedom, Hobby Lobby To share or post to your site, click on "Post Link". Please mention / link to the Greater Fitchburg For Life. Thanks! by Bristol Palin: As I’ve mentioned, I love reading my Bible, especially if some verses really jump out at me. When they do, I’ll share them with ya! Here’s the latest:"The mouth of the righteous is a fountain of life, but violence overwhelms the mouth of the wicked." Proverbs 10:11The part about “the mouth of the righteous” being the “fountain of life” totally reminds me of the wonderful activists in the pro-life movement!!! On the other hand, it also makes me picture pro-abortion advocates and the violence they preach… it just makes me sick. They have “mouths of the wicked,” because they and spew so much violence toward people who are only trying to protect innocent life. Briston Palin may be followed via her blog, on Facebook or on Twitter! Tags: Briston Palin, choose life, To share or post to your site, click on "Post Link". Please mention / link to the Greater Fitchburg For Life. Thanks! by Shawn Carney, Campaign Director, 40 Days for Life: It's always a huge blessing when God answers your prayers ... and a mother chooses life ... and spares her baby. But how about when the Lord hears those prayers ... softens one woman's heart ... and saves two babies! Well, that's exactly what happened ... warming up the volunteers in one of the coldest vigil locations. Here's the story! It's always great to get an email like the one I got from Jerad in Anchorage. "I have some really exciting news!" he said. "I am so joyful right now I can hardly stand it til I tell everyone!" The news was the first save of this 40 Days for Life campaign. Actually, Jerad said, it was the first two saves. "She was carrying twins!" Two volunteers were praying at the vigil outside Planned Parenthood when a woman drove up and stopped. She told one of the men, "I need you to know something." Needless to say, he stopped to listen very closely. "I was going to have an abortion," she said, "but I saw your signs. Now ... I'm having twins!" She was just coming from an ultrasound appointment, and wanted to say thanks to the volunteers, whose peaceful prayer presence led her to her rethink what she was about to do. "I have been praying and claiming that if all our efforts, blessed by God, saved just one life, it would all be worth it," this man said. "Well, we know that so far, there have been two lives saved!" "What a gift, to be honored with such news!" he said. "Praise God!" A woman who was on her way inside the abortion center in Nashville saw the people peacefully praying at the 40 Days for Life vigil. "Once inside," said Roy, the local coordinator in Nashville, "she found that she herself was praying. She realized that she needed to think about this a little bit more, and decided to step outside." She spoke to volunteers, who encouraged her to visit a pregnancy resource center, where she received a free ultrasound and counseling. She decided to keep her baby, and then returned to the vigil site to thank all the people praying for her. "Your presence out there made a difference," Roy said. "It makes a difference ... and it keeps on making a difference in the lives that are saved. God asks us to be faithful — and that is what we need to do." Tags: Forty Days for Life, abortion centers, Day 24, Nashville, Tennessee, Anchorage, Alaska To share or post to your site, click on "Post Link". Please mention / link to the Greater Fitchburg For Life. Thanks! by Shawn Carney, Campaign Director, 40 Days for Life: The next time you’re at an airport, look for Steve Karlen! And if you see him, why not buy him a cup of coffee? It seems like Steve, our North American outreach director, has been traveling a lot during this 40 Days for Life campaign. And he still has a bunch more stops to make before Day 40. Here’s Steve’s account of his recent visits to campaigns in New Jersey and Pennsylvania. We had a great turnout in Morristown – despite the rain! I asked Dennis, another volunteer, about the greatest blessing of the campaign. He simply said, “The biggest change is in us.” The folks in Morristown are working very hard to fill their hours and recruit new participants. Stephen, the local director, is spending many hours on this campaign. It has been hard work, but they are persevering and making this campaign happen after stepping out in faith. The 40 Days for Life vigil in Woodbridge is taking place in the public right-of-way outside an abortion center owned by Stephen Brigham, a notorious abortionist who has lost his medical license in other states. It was a cold day with a biting wind – the weather matched the surroundings. This abortion center was decrepit. Trash was strewn across the property and the building had broken blinds. I was told there had been an ambulance call here during the campaign. There are other challenges as well. Nora, the local coordinator, told me about a pastor she asked to help promote the campaign. He declined, saying he could not support 40 Days for Life. Still, despite all this, God’s grace is shining through. So far, they’re aware of two mothers who changed their minds and rejected abortion. I had a great visit with the 40 Days for Life team in Allentown, too. This is their eleventh campaign! But this is not the first location for their vigil. A couple of years ago, a clinic they had prayed in front of earlier in the history of 40 Days for Life shut its doors and went out of business. They’re praying that this one will close, too! Thanks to Steve Karlen for another 40 Days for Life travel report! Tags: Forty Days for Life, abortion centers, Day 23, Morristown, Woodbridge, New Jersey, Allentown, Pennsylvania To share or post to your site, click on "Post Link". Please mention / link to the Greater Fitchburg For Life. Thanks! Fr. Frank Pavone (, National Director of Priests for Life (http://www.PriestsForLife.o­rg), praying and speaking on the steps of the Supreme Court 3/25/14 as the Court hears the cases regarding the mandate as they apply to businesses. By the end of March 2014, the Supreme Court will decide if they will review our lawsuit against the HHS Mandate! This is big news. We are asking everyone to please pray a special nine day novena to reverse the unjust HHS mandate. Tags: Frank Pavone, Priest for Life, speaking, Supreme Court steps, Christians, HHS mandate ( To share or post to your site, click on "Post Link". Please mention / link to the Greater Fitchburg For Life. Thanks! Eric Scheidler, ProLifeAction offers remarks at the Stand Up for Religious Freedom rally held outside the Supreme Court during oral arguments in the Sebelius v Hobby Lobby HHS Mandate case. Tags: Eric Scheidler, ProLifeAction, Supreme Court, Hobby lobby, HHS Manadate To share or post to your site, click on "Post Link". Please mention / link to the Greater Fitchburg For Life. Thanks! Chaplain Gordon James Klingenschmitt, PhD, Praying In Jesus Name: Air Force Academy government lawyers continue to threaten cadets with punishment for posting Bible verses on their personal white-boards, according to a Christian attorney who spoke to the lawyers and several cadets. I just conducted a TV interview with Christian attorney Michael Berry (watch here) with LibertyInstitute.org, who flew to Colorado Springs to defend the cadets' religious freedom and First Amendment rights. DoD Instruction 1300.17 now says "The Military Departments will accommodate individual expressions of sincerely held beliefs (conscience, moral principles, or religious beliefs) of Service members in accordance with the policies and procedures in this instruction." But Air Force lawyers interpret this to only protect how cadets dress, not how they speak, worship, or publish. Let's keep up the telephone pressure on 3-star General Michelle Johnson, the Academy Superintendent. "Jesus and the Bible are not illegal speech for cadets. Tell Superintendant Johnson to stop cowering to Mikey Weinstein." 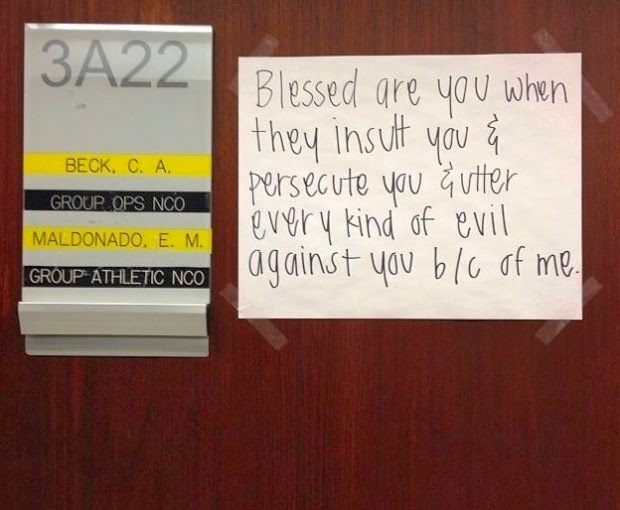 The anti-Jesus complainer Mikey Weinstein "says that there’s a 'revolt' underway at the U.S. Air Force Academy in Colorado Springs," as hundreds of cadets are now posting scripture verses on their white-boards, after one cadet was censored and threatened. The Blaze reports "Cadets angry over the Air Force Academy’s removal of the verse have since begun posting scripture from the Bible and the Koran on their whiteboards in solidarity," in full and open rebellion to Mikey Weinstein, the anti-Christian president of the Militant Religion Foes Foundation. Weinstein said those who put Bible verses on their doors deserve "non-judicial punishment at the very least." Mikey literally wants the military to punish Christians for exercising their First Amendment freedom of the press. But when the devil tries to stamp out the name of Jesus, Jesus spreads like wildfire everywhere else among His people. I am so proud of these cadets, who understand freedom of religious expression means members of the military are authorized by the First Amendment to write, speak, or express their religion freely, even if the Bible offends the easily-offended complainers. Tags: Religious freedom, Air Force Academy, bible verses, Praying in Jesus name, Chaplain, Gordon James Klingenschmitt To share or post to your site, click on "Post Link". Please mention / link to the Greater Fitchburg For Life. Thanks! by Shawn Carney, Campaign Director, 40 Days for Life: Today, we are reminded that anyone can change their mind at the last moment before an abortion. And if we face any discomfort in going out to pray outside the abortion center, it’s worth it to give a mom or a dad a chance to choose life. When they do, we are sometimes surprised. But we must trust that the voice of God will be heard and responded to in that moment. Here are two examples of that happening … from two different countries. It wasn’t hard to see the excitement in Michele’s note from Colorado Springs: “Another baby saved!!! !” Yes, four exclamations! But that’s always great to hear. When a group from Immaculate Conception Church was praying outside the abortion center, a couple pulled over near the stop sign and talked to a vigil participant for quite a while. The conversation went on for a bit, and the couple said they were going in to have an abortion. “The volunteer gave them some information and told them the truth about their baby,” Michele said. The young man then turned to the woman and said, “We can’t do this” – and they left! Michele noted that the sight of sincere, determined, steadfast Christians standing in prayer in uncomfortable weather often makes abortion-minded women stop and think – and choose life for their babies. Tags: Forty Days for Life, abortion centers, Day 22, Campbell River, British Columbia, Colorado Springs, Colorado To share or post to your site, click on "Post Link". Please mention / link to the Greater Fitchburg For Life. Thanks! Air Force Academy: Ad-Verse to Scripture? Project: What Has Roe Done for Us?